At long last I have the bookcase up and have added lots of stuff onto it’s shelves. In fact it is already full *shock* How did THAT happen? I know I know, I am a hunter gatherer! Definitely want to get another one of these, but it will be some time off. I am very happy that the room is more spacious with less cumbersome furniture in it. I have managed to relocate my cane display case into a corner of the loungeroom, so that has also given me some new floor space and a place for my beloved Missy’s bed 🙂 Now she can reside in comfort near me when I create. She is VERY happy about that. She has already tested it out whilst I have been clearing out a cupboard or rearranging things on the bookcase. Ok, better dash and run some errands before I go off to work. Will find the camera, which is still buried on my craft desk somewhere, and take some pics tomorrow. See you then! As much as I have been enjoying the bit of rain we have had recently, the cold is sure bothering me this year. Must be getting older eh? LOL I would love to be tucked into my studio creating, but have to go and brave the elements and go to work. My appologies for no update in the last few days, good intentions and all. I have spent some much needed time in the garden weeding and attending a myriad of other tasks that I have not had time for in recent weeks. Playing catchup can be all consuming as we all know too well. I intend to lock myself in here tomorrow and create up a storm. So many new ideas I have found lately that I want to try. Inspiration comes from many places. 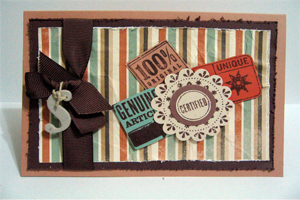 Hope you enjoyed this project using the Boho West Style. I will be back again soon with another project.